Early season hunters should know how to quickly get the animal out of the woods and where to take the meat so it can cool and age. On August 1, all hunters can buy nonresident deer and elk tags as second tags for an additional hunting opportunity this fall. Tags are sold at the full nonresident price of $301.75 for deer and $416.75 for elk. Fish and Game administration bureau chief Michael Pearson said that at current sales rate, nonresident deer tags and elk tags could be sold out quickly. Fish and Game keeps a tally of the tags on the license, tags and permits webpage. Friday, August 10 is the last day to enter the second Super Hunt drawing in 2018 and a chance at winning the hunt of a lifetime. Tags for two elk, two deer, two pronghorn hunts and one moose hunt will be drawn, as well as a "Super Hunt Combo" that will entitle the winner to hunt for all four species - elk, deer, pronghorn and moose. F&G Commissioners agreed to set November as a deadline to decide the fate of the coveted Sawtooth Elk Zone tags. The popular tags have been available on a limited, first-come, first-served basis for many years, which has created high demand at license vendors and online sales. Sawtooth tags have sold out in minutes, which left many hunters empty handed and disappointed. Commissioners are considering continuing the status quo, converting the Sawtooth Zone to controlled hunts, or a combination of the two. Resident hunters wanting to purchase a general season elk tag in a capped zone will need to keep two dates in mind in July. On Tuesday, July 10, all resident capped elk zone tags, except for the Sawtooth Zone, go on sale at 10 a.m. (MDT) at Fish and Game offices, license vendors, with a credit card at Fish and Game's online vendor, or by calling (800) 554-8685. 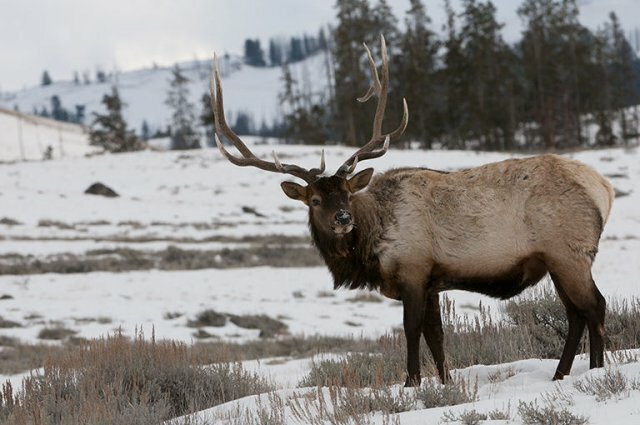 The Idaho Fish and Game Commission is considering two options for the 2019 hunting season in the Sawtooth Elk Zone, and hunters can take a brief survey to show their preferences. Deadline to comment is July 2. The elk population within the Sawtooth Elk Zone (Units 33, 34, 35, and 36) has increased in recent years, but remains below Fish and Game's elk management plan objectives. The cap on A and B tags remains in place to limit hunter participation and harvest. Hunters have until midnight Monday, June 5 to apply for this fall's deer, elk, pronghorn, black bear and turkey controlled hunts. Sawtooth elk zone tags for nonresidents go on sale today May 10 at 10 am MDT. CWD is a neurologic disorder that causes the brain to degenerate and develop cavities becoming sponge like in appearance. It is caused by abnormally folded proteins called prions. CWD is contagious between animals by either direct or indirect contact with infected animals or their habitat. CWD is not believed to be contagious to people. Where Is The Disease Found? CWD has been documented in numerous states in the US, several Canadian provinces (Ontario, Saskatchewan, Alberta), South Korea, Norway and Finland in a variety of cervid species. It has been found in both captive and wild cervids. The current distribution of CWD in North America can be found in various links provided here. To date, there is no evidence that CWD is present in free-ranging deer or elk in Idaho. Animals infected with CWD are typically thin and show neurologic signs. The most common sign of CWD is lack of feeding, increased drinking and excessive salvation and urination. Behavioral signs include loss of fear of humans and loss of awareness of their surroundings.The most common signs of CWD in live cervids are emaciation and neurological signs. There are no typical lesions seen in animals that die of CWD but consistent signs include poor body condition and aspiration pneumonia. The bacteria that are commonly associated with abscesses are common in the environment. A variety of bacteria are associated with abscesses in deer and elk including Corynebacterium pseudotuberculosis Trueperella pyogenes, Pseudomonas spp., Streptococcus spp. and Staphylococcus spp.. Most abscesses are found in lymph nodes and internal organs and contain thick, greenish yellow or white purulent material. Abscesses occur commonly in many species of wildlife across North America. Abscesses of many origins in many wildlife species have been documented in Idaho. Abscesses are typically characterized by variable sized pockets of pus which can be located anywhere on the body, usually under the skin or in skeletal muscles. In mammals, abscesses do not typically cause illness because the abscess is usually localized. Abscesses that spread along the muscle layers, or into various organs may cause pathological conditions that can be detrimental to the animal's health. In birds, abscesses usually form enlarged spherical areas that may hinder movement or feeding ability. In raptors, the feet are often involved (bumblefoot) and the enlarged areas can result in an inability to stand and to capture prey. Brucellosis in elk, bison, and cattle is caused by Brucella abortus. There are a variety of other Brucella species can affect sheep (B. ovis), goats (B. melitensis), pigs, caribou and reindeer (B. suis), dogs (B. canis), and several species of marine mammals. Brucellosis is found worldwide in livestock, but most countries have control or eradication programs to control or eliminate the disease. Brucellosis has largely been eliminated from domestic livestock in North America. A reservoir of brucellosis occurs in elk and bison in the Greater Yellowstone Area which includes eastern Idaho. Because wild ungulates and cattle share range, disease transmission to domestic cattle is of great concern. There are no obvious signs of brucellosis in infected animals. Abortions can occur in the middle trimester of pregnancy. Elk infected with brucellosis may abort between January and June. There are no typical outward signs of Brucellosis in most animals. Males that are infected with brucellosis may have swollen testicles or swollen joints. In chronic infections can lead to infertility in both males and females..
Carotid Artery Worm is caused by a parasitic nematode (Elaeophora schneideri) found in white-tailed deer, mule deer, elk and moose. Carotid artery worms are widely distributed in the western United States, several southeastern states, and areas of Canada. The parasite has been documented in many parts of Idaho in mule deer, moose and elk..
Carotid artery worms are native parasites of mule deer, but have been found in white-tailed deer, mule deer, elk and moose. Most animals show no signs of sickness. However, some animals can exhibit signs including malformed antlers, blindness, muzzle or ear necrosis (destruction), and oral impactions which are caused by the worms restricting blood flow through arteries. Giant liver flukes (Fascioloides magna), also known as the American liver fluke or deer fluke, are flatworms are important parasites of deer, elk and moose in North America. The flukes are a normal parasite in white-tailed deer and occasionally elk. Giant liver flukes are found in mule deer, white-tailed deer, elk, and moose in many parts of North America. Giant liver flukes have been documented sporadically in a few mule deer, elk and moose in Idaho. Animals infected with giant liver flukes generally appear healthy unless large numbers of flukes are present. With large numbers of flukes, generally the liver function is compromised leading to animals in poor body condition. In definitive hosts, flukes are found in yellowish-white fibrous cysts that 1-2 inches across that contain pairs of flukes. A reddish brown liquid is found inside the cysts with the flukes. In animals that are not definitive hosts for giant liver flukes, the flukes can cause significant liver damage and ill thrift or death in severely affected individuals. The flukes continue to migrate in the liver creating numerous tracts and extensive liver damage that can lead to fibrosis and liver failure. Hydatids are the immature form of a tapeworm called Echinococcus granulosus. Echinococcus granulosus is a very small (3-5 m) tapeworm that requires two different animal species, a canid and an ungulate, to complete its lifecycle. Hydatid disease is found around the world including North America where it exists in two forms – a domestic form involving domestic dogs and domestic sheep and a sylvatic form involving wolves or coyotes and ungulates. The most common form of E. granulosus is found in domestic dogs and sheep, and is found worldwide, including the western USA. The form in domestic dogs and domestic sheep is the most common source of the disease in humans. There are numerous strains of E .granulosus worldwide that occur in various host species systems e. g. wolves and wild ungulates in temperate North America, dingos and kangaroos in Australia, and jackels and domestic cattle in Africa. Hydatid cysts have been found in cattle and domestic sheep, deer, elk,. moose and mountain goats in Idaho. Adult tapeworms have been found in wolves and coyotes in Idaho. The adult tapeworm occurs in the intestines of wolves, coyotes and foxes but they are generally asymptomatic. The larval form or hydatid cyst occurs in moose, elk and deer, and can occur in humans. In moose, deer, and elk, the cysts have thick walls and are filled with a clear watery liquid. The cysts are usually found in the lungs but can also occur in the liver or other organs. Cysts can vary in size from ¾ to 4 inches in diameter and contain hundreds of juvenile tapeworms. The presence of hydatids in herbivores usually does not cause clinical signs unless the cyst obstructs normal body function. If cysts rupture, illness can be severe. Meningeal worm is a nematode parasite, Parelaphostrongylus tenuis. Meningeal worm is found throughout eastern North America but is usually restricted to east of the 100th meridian. Meningeal worm has not been documented in Idaho. In the normal host, white-tailed deer, and occasionally elk, the parasite causes no clinical disease. In most elk and other ruminants (domestic sheep and goats, mule deer, moose, elk, bighorn sheep, mountain goats), the abnormal migration of the L3 causes paresis of the limbs that can lead to paralysis and death. The most common pathogens in bighorn sheep are respiratory bacteria Pasteurella haemolytica or Pasteurella multocida, and Mycoplasma ovipneumonia but respiratory viruses like Infectious Bovine Rhinovirus, Parainfluenza virus, Bovine Respiratory Syncytial Virus, or parasites like lungworms can contribute to pneumonia in bighorns. There is evidence in captive and free-ranging bighorn sheep that transmission can occur after contact with domestic sheep or goats. Other species of ruminants can develop pneumonia from Pasteurellacae and other bacteria including Arcanobacter spp., Corynebacterium pseudotuberculosis, and Trueprella pyogenes as well as a variety of respiratory viruses. Lungworms can also be associated with pneumonia. Generally, pneumonia is a problem in bighorn sheep and to a lesser extent in deer and elk. Pneumonia in bighorn sheep has been found throughout North America. In Idaho, pneumonia in bighorns has been found in all areas where bighorn sheep exist. Isolated cases of pneumonia have been documented in mule deer, white-tailed deer, elk, moose, pronghorn and mountain goats in Idaho. Clinical signs of pneumonia in ruminants include coughing, shortness of breath, and a weakened condition. Generally, animals with pneumonia will have discolored lungs possibly with adhesions to the rib cage or abscesses. In trials of captive bighorn sheep that are inoculated with Pasteurellaceae bacteria, survival is generally less than 2-3 days. Depending on the bacterial pathogen present, the nutritional and immune status of the individual, and other factors, affects range from chronic pneumonia in adult females, summer lamb mortality events and ill thrift to rapid whole herd mortality events . Often the mortality events are found by hunters or during herd surveys when carcasses or skeletons are found. Similar signs of disease occur in other ruminants affected by pneumonia but pneumonia in other species of ruminants tends to occur in single individuals rather than on a herd basis. Several species of tapeworm produce cystercerci in the intermediate host. The most common in cervids is Taenia hydatigena, but other species including T. pissiformis and T. krabbei. Tapeworm cystercerci are found in appropriate ruminant hosts across most of North America. They are commonly reported in ungulates in Idaho. Cystercerci are usually small bladders, approximately 0.5-2 cm in diameter, containing fluid and a single larval tapeworm. The location of the cystercerci depends on the tapeworm species and the host species. Taenia hydatigena and T. pissiformis typically form cystercerci in the mesenteries or the liver. Taenia krabbei typically forms cystercerci in the skeletal muscle. There also may be white, star-like scars on the surface of the liver from the migration of larval tapeworms. Carnivores like wolves, coyotes and foxes are the definitive host of the adult tapeworms and usually appear healthy even though they may be infected with large numbers of tapeworms. Treponema Associated Hoof Disease (TAHD) in elk is associated with a spirochete bacterium, Treponema spp. TAHD in elk is a relatively new condition in elk. Elk with hoof problems were first recognized in southwestern Washington in about 2000 with a dramatic increase in the number of affected animals reported in 2008. Since 2008, extensive surveillance by Washington Department of Fish and Wildlife has confirmed TAHD in elk in 14 counties in western Washington with scattered but unconfirmed cases in eastern Washington. TAHD was found in elk in Oregon in 2014 in an initial cluster in northwest Oregon. Since then, confirmed cases have been found in several areas of western Oregon with scattered unconfirmed cases in eastern Oregon. In December 2018, an adult female elk killed by a hunter near White Bird, Idaho in GMU 14 was found to have obvious foot abnormalities. The lower leg was submitted for diagnostic testing and TAHD was confirmed in this animal. Animals affected by TAHD may be deficient in trace minerals like copper and/or selenium. The disease affects males and females of all age cohorts. Affected elk of all ages are lame with various degrees of deformed to elongated hooves, or with broken or missing hooves. Winter ticks are a one-host tick of ungulates. Large numbers of ticks can cause anemia due to blood loss, hair loss due to excessive grooming, and poor body condition due to inadequate food intake. Winter ticks are present in nearly all areas of ungulate distribution in North America except for Alaska. Winter ticks have been identified in most ungulate species in Idaho. Winter ticks are usually not seen on animals in the larval or nymphal stages as these are relatively small. The adult males and females are the same size as typical wood ticks. The engorged adult females can be 1-2 cm in diameter. Moose, elk and deer with large numbers of winter ticks often lose significant amounts of hair, especially in late winter. Some of these animals may be lethargic and appear weak from loss of blood, hypothermia and inadequate nutrition.